Another wonderful package came in the mail this week! I swapped some soap with Ksenija from SenMi Soaps and she sent me this lovely assortment of her soaps, all the way from the Netherlands! You can see that the titanium dioxide didn't make any difference in the long run, but the vanilla stablilizer has held up extremely well (except in the Grandma's Kitchen fragrance!). Pretty impressive! You will for sure enjoy SenMi soaps although it will not be easy which one to choose and try first! I am so happy that had opportunity to use them myself and it was such a wonderful experience. You've been getting some very nice soaps in the mail lately, Cee Gee! Ksenija's soaps are lovely. And the results of your vanilla stabilizer tests are very interesting. 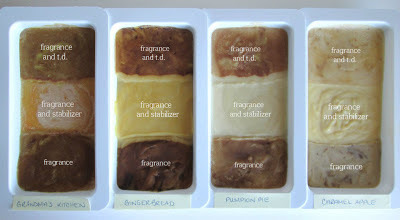 I had always thought that VS didn't work well in CP soap, but it has held up very well in three of your four soaps. Something for me to keep in mind! I thought it was interesting too Jenny, it has held up much better than I expected. I should really try to embrace the discoloration rather than fight it, but it's nice to have this option for certain fragrance oils. 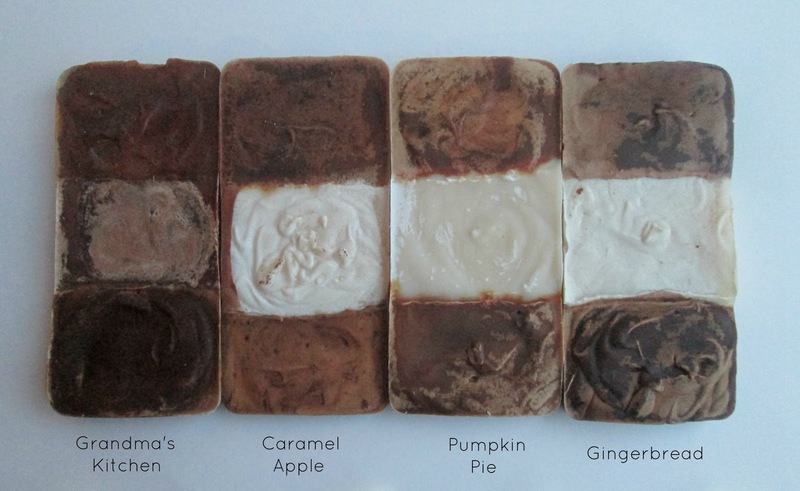 I love the soaps Ksenija makes, she is very talented! 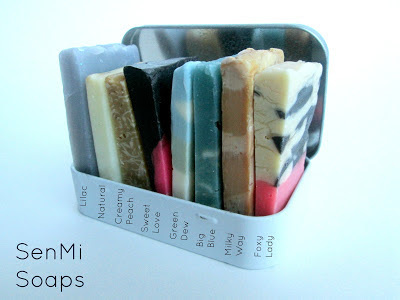 And her blog is a pleasure: interesting posts, gorgeous soaps! It will be difficult for you to choose one for sure! Thanks you for sharing here your experiments about vanilla stabilizer!I haven't tried it yet. Thanks so much Natalia, that is very sweet of you...you have a good weekend too! What a difference this stabilizer makes,that's really amazing. First time for me to see the same soap with and without it. Great idea to share this experience,NG should pay you for advertising them! 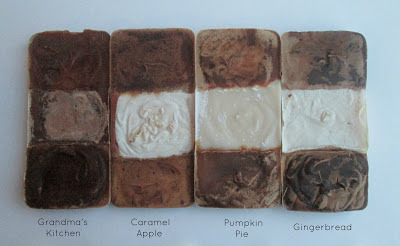 Ksenija's soaps, well I envy you, but hopefully not for long, cos I think I might get some of those,soon! Can't wait! Oooh, lucky you getting Ksenija's soaps too! I really appreciate being able to try other soaper's soaps, it really has opened my eyes to a lot of things I would have missed otherwise. Beautiful soaps you got from Ksenija, I love the colours. And your experiment is really cool. If you hadn't said anything I'd have thought that was all done on purpose. I'll try to remember to post these soaps again in 6 months, will be interesting to see how they are then! Thanks Amy, I've been really impressed with it so far and I love that you can use less of it. I've set the soaps aside and will post what the soaps look like at 6 months for comparison! Hi Sarah...I agree with you, some soaps are much nicer left to their natural colors :) It is amazing how well the stabilizer has held up, I'm quite surprised how effective it is! Hi Cee Gee i have been following your blog for sometime but is the first time i have decided to leave a comment. You have such and informative blog and i am enjoying every moment of it. Started from the very beginning. I have learnt alot. Thanks for sharing this. I used NG Stabilizer last night actually but i used it on the 1:1 Ratio and my soap smell like the stabilizer. i can't smell the fragrance at all i hope it fades out. Have you experienced this? Hi Alysia, thanks so much for your nice comments and I'm so glad you are enjoying the blog! I would email NG and ask them about it, they have great customer service, so hopefully they will be able to enlighten you more. I'd love to hear an update if you find out any more information!